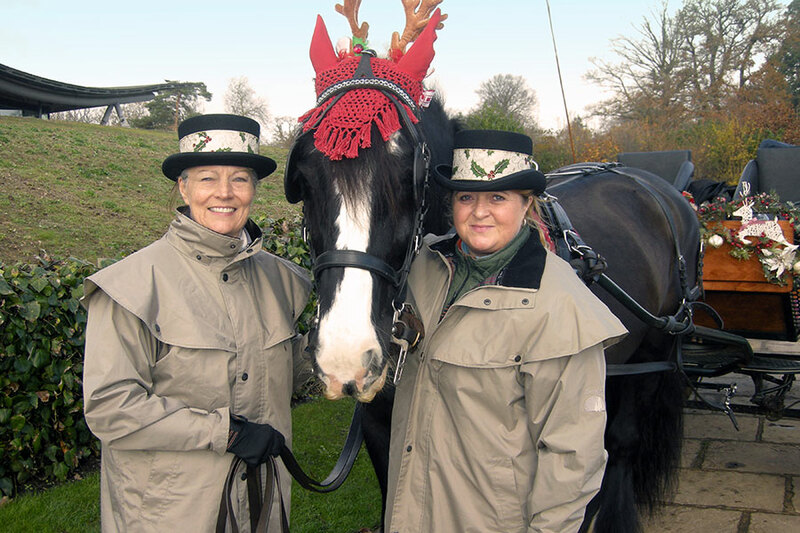 Festive Horse-drawn Carriage Rides in Windsor Great Park from the Savill Garden, Wick Lane, Englefield Green, Surrey TW20 0UJ start Saturday 1st December & run until Saturday 5th January 2019. Click on our calendar for Scheduled Dates! The horse & carriage are beautifully decorated with twinkling gold & white berries for the Festive Season and our magnificent part-shire horse will of course be wearing antlers! Treat the family and loved-ones, you can snuggle up with our cosy lap rugs as we take you on a relaxing journey through the Winter landscape of Windsor Great Park. We have Christmas Toys on board for the little ones, and you may even hear some Festive music! We love taking Romantic Couples on the carriage just for themselves, and can provide champagne on request, so we tailor the ride to our audience!! Surprise wedding proposals are most welcome at this time of year! Because of the shorter days, we run between 10.30am and 3 pm, rides are popular at this time of year so early booking is essential. It’s weather permitting and therefore just cash payment on the day please, we are a small firm with no card facilities. If the weather (rain, high winds, or icy conditions) prevents us running we will let you know by 9.30am on the morning, all rides are confirmed by text. 30 min Rides are recommended at this time of year £60 per carriage/because of the Vintage Carousel operating in the car park we start the rides from the Cream House one mins walk to the right of Savill Building, we have a bench seat & sign there. Families love to Rendezvous at Savill Garden for a Coffee, Christmas Lunch or Festive Afternoon Tea plus a Christmas Carriage Ride. Plus it’s just £5 entry for Adults to Savill Garden in Winter Months. Please call to check availability for the carriage ride on 07811 543019 before booking your lunch at Savill Garden 01784 485402. If the weather prevents the carriage running, we call you, but there’s still a traditional Christmas Lunch & Festive Visitor Centre to enjoy! 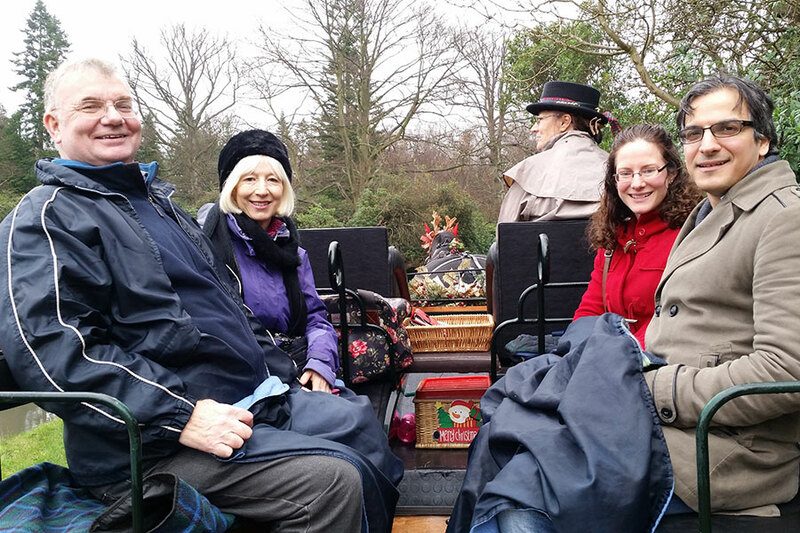 We had a lovely trot round the park, stopping at the Cow Pond for mulled wine and mince pies. Henry (the horse) was suitably attired with antlers for the festive season, and the carriage was decorated too.